The only part of babywearing I regret, is not getting a soft-structured carrier (SSC) sooner. Babywearing has made our lives exponentially easier and is perfect for me as a self-proclaimed lazy mom. 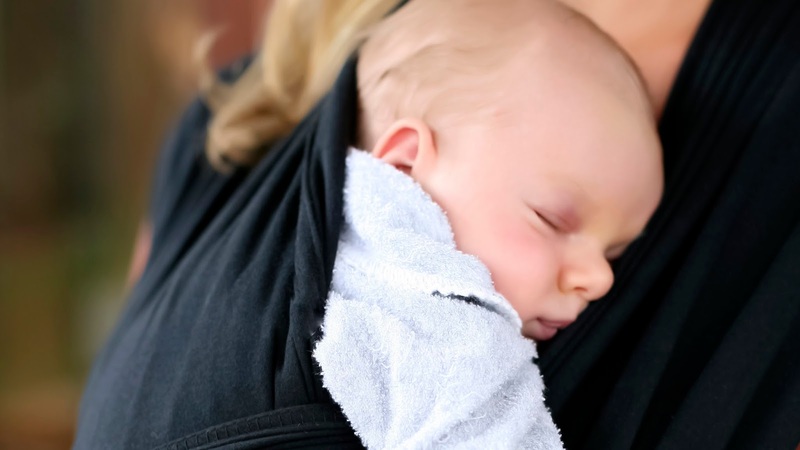 Here are 6 times when babywearing has made our lives easier. 1. The Grocery Store - Or any shopping for that matter. Some kids just do not care for sitting in the shopping carts, or at least not for very long. But our daughter is always happier when she's up in our arms (or the carrier.) Babywearing at the grocery store keeps the little one happy which gives us time to get our shopping done. It is also much safer and takes away the fear of someone snatching your little one from the cart. 2. Theme Parks - Have you ever tried navigating a theme park (or festival, or other crowded event) with a bulky stroller? It's not easy. I've gotten my fair hare of dirty looks from strangers as I accidentally ran into the back of their ankles. Babywearing makes maneuvering through crowds much easier. 3. Traveling - Getting through airport security, boarding the plane and flying across the country were a breeze with our SSC. We didn't even bring our stroller, just wore our daughter while visiting museums, restaurants and even a football game. 4. The Park - I tried to get out to the park every day to walk the trails (and lose that baby weight!) But every day ended the same way, my daughter would start crying in the stroller, I would end up carrying her most of the way while pushing the stroller and I'd end up with sore arms and back. Babywearing always keeps her happy and has made my park walks easy and pain free by eliminating the need for a stroller. 5. Nap Time - Sleep does not come easy to many babies, but baby carriers seem to come with a magical sleepy dust that makes nap time easy. The hubby particularly likes to use this method for nap time, which gives me time to rest! 6. Around the House - As much as I would love to lay around in front of the TV all day, there's stuff that has to be done. It's difficult to get household chores done and watch a baby at the same time. Especially when that baby is mobile, and loves to get into EVERYTHING. Babywearing keeps the little one happy while I do the dishes, vacuum, mop, dust... you get the picture. If you are new to babywearing, check out our articles: Benefits of Babywearing, Types of Baby Carriers and Babywearing on a Budget.